Tendai Biti appears at the Harare magistrate's court. MDC Alliance principal Tendai Biti, who is facing charges of inciting violence, was yesterday back in court challenging the jurisdiction of the court to hear his matter considering the circumstances surrounding his arrest and return to Zimbabwe. He is alleged to have unlawfully declared opposition party leader Mr Nelson Chamisa as the winner in the Presidential elections last week. In terms of the country's electoral laws, only the Zimbabwe Electoral Commission (ZEC) is empowered to declare the winner of an election. Biti appeared before Harare magistrate Mr Francis Mapfumo. 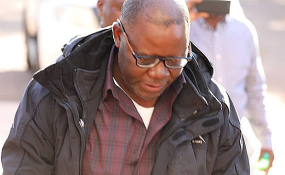 Through his lawyers -- Ms Beatrice Mtetwa, Messrs Alec Muchadehama, Harrison Nkomo, Gift Mtisi and Denford Halimani -- Biti wants the court to determine whether his appearance in court was proper given the circumstances of his case. Biti, who was denied asylum by the Zambian government after he tried to seek refuge in that country on Wednesday, also wants the court to determine whether the police complied with the law after he argued that he was unlawfully arrested in Zambia by unidentified Zimbabwean men. In his evidence-in-chief led by Ms Mtetwa, Biti narrated to the court circumstances that "forced" him to cross the border, his arrest and appearance in court. He said when he sought asylum in Zambia, he was not running away from the police. "For the record, I did not seek asylum because of the charges, but political persecution," he said. "When Charity Charamba (Senior Assistant Commissioner) told journalists that they were looking for me, my lawyer Alec Muchadehama went to CID law and order intending to advise them that I was to surrender myself on that day at 2pm." The police officers he met there said they were not aware that he was wanted and he was told to leave his business card and they would contact him if they wanted him. "On August 6 my other lawyer Mr Harrison Nkomo went to CID law and order and told them I would surrender myself to the police not to the junta. While we were contemplating with my lawyers, we concluded that CID law and order were not in charge but other forces were. "On the evening of August 6, Mr Nkomo wrote a letter to the Police Commissioner-General Matanga asking him if he was in charge of my arrest and asked him if they were not going to hand me over to other forces upon my arrest. There was no response from Matanga." Biti told the court that his mother, brother and nephew were harassed by unidentified men who went to his mother's house looking for him. "I then concluded that my life and that of my family was in danger hence I decided to flee," he said. "I was unlawfully returned to Zimbabwe despite the fact that my life was in danger. No court in Zimbabwe has jurisdiction over me, I should be in a Zambian court since an order was passed by a Lusaka judge. In light of these violations of international laws, Zimbabwe and Zambian domestic laws, my deportation is a nullity and anything that follows is a nullity." "In the event that the court finds I am properly before this court, I will challenge the decision in every court so that what happened to me does not happen to anyone and does not repeat itself. I will pursue my rights in the local and regional courts." Prosecutor Mr Justin Uladi said the State would lead evidence to prove that Biti was arrested in Zimbabwe by police officers on the strength of a warrant of arrest. The court remanded the matter to Wednesday next week when the State is expected to lead evidence from the investigating officer.